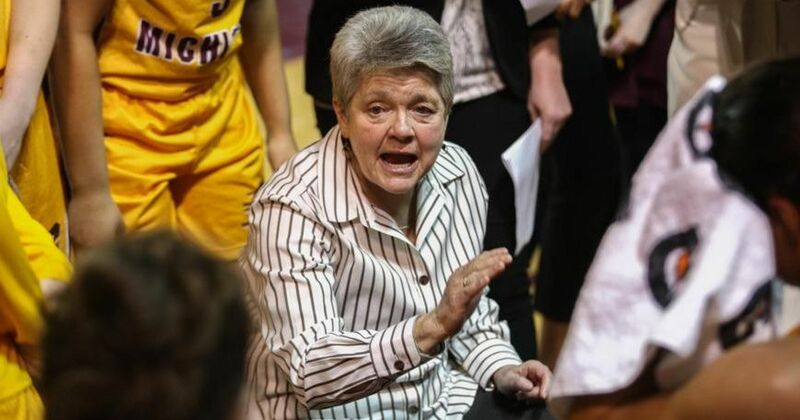 Sue Guevara guided Central Michigan to a first-ever Sweet 16 berth last season. Photo courtesy of Central Michigan Athletics. Last season – the tenth for coach Sue Guevara at Central Michigan – the Chippewas went a program best 30-5 and earned a Sweet 16 berth for the first time. They finished the regular season ranked 20th in the AP poll, with an RPI of 15. Guevara began her coaching career at Saginaw Valley State, where she was both the basketball and softball coach from 1979-1984. During part of that time, she was also earning her Bachelor’s degree. She served as a graduate assistant at Ohio State University, was an assistant coach at Ball State, and then worked as an assistant coach at Michigan State from 1987-1995. From 1996-2003, Guevara was the head coach at Michigan. After a stint as assistant coach at Auburn under Nell Fortner, Guevara was hired at Central Michigan. 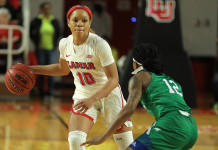 The Saginaw, Mich. native signed a contract extension last April that will keep her with the Chippewas through the 2022-2023 season. In your early sports life, you played both softball and basketball. How did you ultimately come to choose basketball? I always loved basketball, so in order for me to stay on with it I had to be the softball coach (at Saginaw Valley State). I was fortunate enough to know the game, because I’d played softball my whole life. But there’s nothing like coaching softball in Michigan at end of March when there’s already snow on the ground and it’s snowing. (A coach at a nearby school), was also coaching both sports, and one day she and I were both freezing, and we crossed paths when we were trading bases. We looked at each other and laughed: “what are we doing?” So when it came time to choose, I liked a warm gym. You were bred into a sports family who let you be a tomboy. How did that shape your life? I was very fortunate in that my dad was drafted by the Detroit Tigers. But he was 22 years old and had three kids, so he didn’t go. But he played basketball in Saginaw back in the day, so I was always around the game. Mom was a ice skater and a swimmer. When I was growing up, girls weren’t supposed to go into sports, and there were no scholarships. But my parents both played sports, and I was around sports my whole life. I went to school for nursing because there were no jobs in sports. Then I went back to school to be an athletic trainer, so I found a way to get into sports. How were you able to go to school and coach at the same time? When did you know you wanted to coach? Back in the day (going to school and coaching) is what you did. At one point I was the assistant basketball coach, the head softball coach, the intramural director and the cheerleading adviser – all for $8,000. But that’s what you did, and you loved it. You had to. Looking back on your early coaching years until the present, how are you different as a coach? What hasn’t changed? My love of the game, my passion for it, my energy hasn’t changed one bit. I have ice cold hands and am sweating like a farm animal before every game. I’ve always had good relationships with players, and I feel like I still have that. I think I’ve gotten better with parents; hat aspect has changed a lot. I think I’ve also finally got it through my thick head that a day off is a day off. Basketball doesn’t have to consume my life seven days a week. It’s taken me a minute to understand that, and to understand that I’m not going to fix everything that needs to be fixed in one day – especially with freshmen. Setting the system up of what we do, it has to be what I like. I can’t be Pat Summit, I can’t be Muffet McGraw; I’m me. And then to recruit the kids into the system and really create the culture that you want, and getting the kids that buy into it. Sometimes you want to get the most athletic kids, but those aren’t always necessarily the best kids. Taking academically at-risk kid, taking kids who are divas: I finally learned that isn’t always the best idea. Your coaching path has taken you from majors to mid-majors. What is different between the two types? Money. Budgets play a huge part for a team. For me being at Michigan and going to Auburn, I have seen the differences. Travel is different. I think sometimes there’s a high level of expectation at a BCS, and that’s true at Central Michigan here, too. But it’s not life and death here. At a BCS you have to take more risks. I don’t have to take as many risks here when it comes to recruiting. I love being out in the community, and I love the size of our community and the size of our school. What is fun about coaching at Central Michigan? I’m having a really good time. I have surrounded myself with good assistant coaches – that’s first and foremost. I work hard and I play hard, too. I like to have people play with me. I’m 64 and my DOBO is 22, and she likes to hangout with me. The community here in Mount Pleasant has been loyal fans of women’s basketball from way before I got here. They’ve seen the good and the ugly, and they’ve stayed on. I’ve been fortunate to work for school presidents who really love women’s basketball and who support it. We have great support systems here. I’ve lived in many places, but I do love living here, and I do like the size of the city and the University. How do you remain relevant with the way the game and the kids who play it have changed? I have assistant coaches who keep me up on things. I don’t have any issues talking with players when they’re playing music and asking what the hell are (the artists) saying. They laugh at me, and I laugh back. So they help me with that. When it comes to the game, the day that I stop learning something is the day I hit the dusty trail. 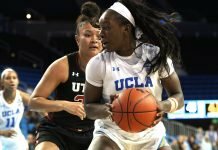 I watch a lot of games, I watch the WNBA, I read the analytics and see how the game is played. I have good friends and mentors I talk basketball with regularly. I read “the coaching toolbox” every day. I read a lot – motivational things – and I try to get books that relate to our kids. I feel like I’m an open book when players come and talk to me, and I like to stay in contact with players once they leave. How did last season turn out to be one of your most fun seasons coaching? Was that a surprise to you or did you see that coming? Did I see that coming? No. We had our mantra, “embrace the change,” and our challenge was that we had “FTP”: finish the play. The year before we were devastated by our loss in MAC Tournament because we didn’t finish the play. When we got in tight games last season, we always tried to finish the play. Players drank the Kool-Aid because every single game, they finished the play. When it was all over, we only lost five games. We had some really close games, sure, but there was never a doubt. The mental toughness we displayed was outstanding to me. Now, those lessons our upperclassmen learned, they are showing to the underclassmen. What is the best thing about working with young people? They keep me young, and they keep my spirit and energy going. With so many different majors that the players have, I’m learning a lot about other things besides basketball. I’m living the dream right now. When I got let go at Michigan, that was one of the lowest points of my life, but it inspired me to keep working hard. Who were your mentors in the game? At Saginaw Valley there was Marsha Reall, who in the 80’s was way ahead of the game by being into the mental aspect and psychology of it. 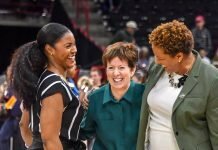 Tara Vanderveer, Karen Langeland, Nell Fortner and Gail Goestenkors. What position did you play in basketball? What kind of a player were you? I was a guard, and I was an aggressive, aggressive rebounder and defender. The post players loved me because I got them the ball. What do you do to blow off steam or release tension? I have a group of friends and we work out every morning at 6 a.m. Whether we are running, swimming, lifting or doing yoga, we get it. I do triathlons. I’m the grandma of the group; they are 48, 51 and 34. We have a great time.